Ok, so I didn’t see Manneue Pis, but I did see Jeanneke Pis. 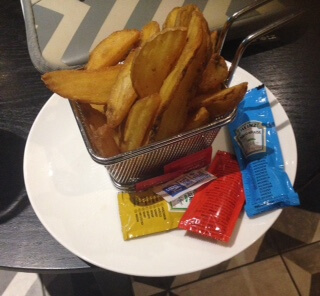 AND I want to confirm that yes I tried the fries and they were fantastic. Big deal coming from an American, no? But somethings keeping me from fully enjoying Belgium. It’s Friday and day one of the seminar, my blog gets published today and I haven’t written it. AHHHGGG! I want to be present, to enjoy this moment. Yes, it’s a seminar and it’s work, but I love my work and I love NET. The people who gravitate towards NET are my people. I feel at home and with family, even though I've never met this group of new to NET Europeans. This is one of the first seminars we’ve had in Europe. So I am a veteran, and this is an odd feeling, I’m the only certified NET practitioner here. And I must say that becoming certified is no small feat. NET fell into my lap and helped me heal from burnout. 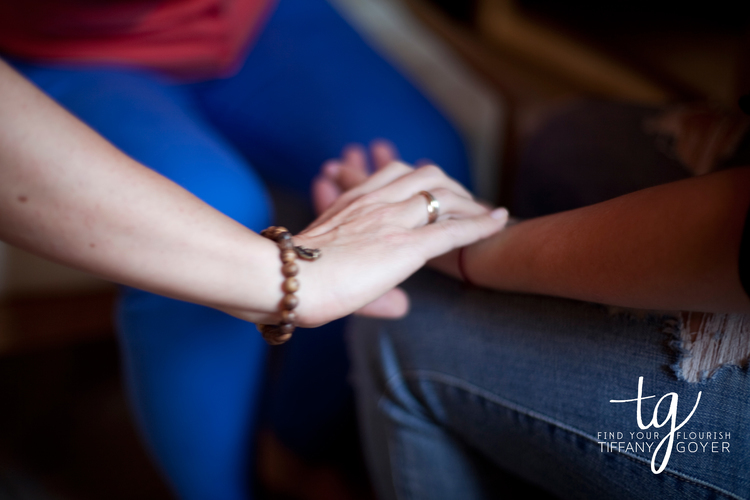 The experience allowed me to understand that there's a faster and easier way to help people heal and have better longer-lasting results than talk therapy alone can do. My burnout was a blessing in disguise, the universe’s way of leading me down a path of mind-body healing techniques like NET, yoga, coaching, nutritional response training and international retreats. Here's a few picture of me doing NET with some of my participants on the "Find Your Flourish France Retreat." Most of you busyaholics out there are like me, I’m a “recovering perfectionist," which means I’ve been painfully familiar with procrastination. And sometimes in recovery, we have “slips.” So I knew I needed to get some NET to help with this old pattern. Perfectionism leads to procrastination. It’s a deadly cycle that can rob you of your dreams if you’re not careful. I’ve got time set aside every Monday to write my blog and send it over to my VA for publishing, but I’ve had a few weeks here now that I haven’t done it on time. I feel guilty & ashamed. I feel bad for my VA who's had to scramble to get it together at the last minute. Lately, I’d say I’m a procrastinator again. I’m falling back into my old ways. Or am I? It’s all in how and what I choose to believe. With all these thoughts, shame seeps in… "For goodness sake, I teach & coach on this stuff, what’s wrong with me?" The adrenaline kicks up as a chemical cocktail of emotions gets released and flood my bloodstream. I try and push the thoughts away. I know beating myself up just makes procrastination worse, or anything for that matter. Whatever you beat yourself up for just grows worse. Maybe it’s over-eating, over-drinking, over-Facebooking or over-Netflixing, you name it. You beat yourself up and you’ll see how you want to do more of the same thing you’re are beating yourself up for. It’s a bad cycle. My face feels flushed and hot, my palms sweaty. All I can think is, "I haven't done my blog and I should've already done it. The thought loops. So do the chemicals because thoughts cause feelings, and feelings release chemicals in the body. "But I’m deep in my practice of self-acceptance, so isn’t this shame supposed to be distinguished forever?" Results: I’m not following through on my commitments to myself and I end up procrastinating more. These results just prove my thought and I don’t follow through on my commitments and I have a slew of other negative thoughts to contend with. Burnout anyone? Does this cycle of putting things off, feeling shame, having negative self-talk, and paralyzation followed by more shame, and a to-do list a mountain long, followed by yet more paralyzation sound familiar? But you’re not a fraud my friend, you are totally capable, strong and you get sh*t done. But do you see how hard it is to do when you get stuck in this procrastination boobie trap trip? My thought was total B.S. Next thing I know I’m volunteering to go up on stage for "all the world" (at least my peeps in the seminar) to see my shameful confession. Natalie our instructor takes me through the 2-minute NET clearing. Something I’ve done countless times with my clients. You all ask me what happens in NET, so I’ll give you an example of how the 2-minute stress release technique works. I say, “I want to be ok writing my blog today.” I tell her and “all the world” or in French, “tout le monde,” my secret and a little backstory… I’ve managed to slip into this saga of procrastination again. But only if I keep telling myself this story. The patterns are strong. The feelings intense. The love comes and I let go. I let go of all the past self-abuse I used to have before I was in recovery from Procrastinator’s hell. Then she asks me to repeat it again as she muscle tests me. I say, “I’m ok writing my blog today.” I say it into the microphone with gusto as she muscle tests my arm, and boom it’s weak, indicating that my brain isn’t congruent with me writing my blog today. “Damn!" But I already knew it. Still, I really wanted it to be true. Have you dealt with something similar to this lately? I wanted it to be true on Monday, but clearly, I had some competing thoughts getting in the way. What do you want to be true that isn’t true right now? Next, she finds the emotions associated with this picture of me feeling stuck around doing my blog. She finds the meridians on my wrists, that are associated with the organs of the body that are related to the emotions of "False Pride" and "Low Self-Esteem." I’m not shocked. She asks me to put a sentence together about WHY I feel "False Pride" and "Low Self-Esteem” about my blog. I tell her and "tout le monde." And now all of you too. I’m determined not to allow this to be a secret. So many of you are also suffering with this stuff. I love my job, helping women find the validation they've been searching for that’s been inside of them, all along, just buried under their mind chatter — sometimes self-abusive talk, so they find their "diamond confidence in the rough.” But I got stuck in the pattern myself again. Ode to working on yourself. Then Natalie asks me to hold the pressure points on my wrists that are related to these emotions and breathe through this scene of me wanting to but procrastinating about writing my blog. In NET, contacting the pressure points releases the physiological effects of the emotion, along with clearing out old negative thought patterns caused by past programming and repeatedly thinking the same negative thought loops that keep you stuck on the neuropathway purgatory prison. These “stuck” "neuro-nets,” are like cobwebs and debris in your mind. We do this work to clear them out so that you can think clearly, and release the blockage in thinking so you can have access to other thoughts, feelings and ways of being, acting and doing that are possible but were seemingly unavailable to you before. I often have clients tell me after an NET session, “I felt so stuck in this before, I didn’t know what to do, and this week, I just came up with a whole bunch of ideas and started to take action. The emotional charge I felt before wasn’t even there." 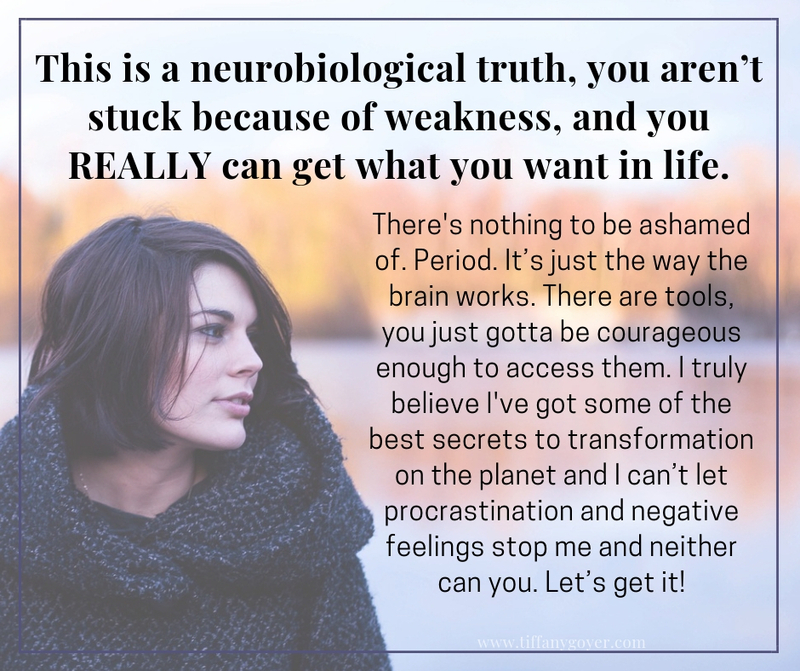 This is a neurobiological truth, you aren’t stuck because of weakness, and you REALLY can get what you want in life. There's nothing to be ashamed of. Period. It’s just the way the brain works and there are tools, you just gotta be courageous and willing to access them. I truly believe I've got some of the best secrets to transformation on the planet and I can’t let procrastination and negative feelings stop me and neither can you. So let’s get it! Connect with your “WHY,” next time you battle procrastination, that'll keep you moving! With the NET work, I naturally shifted from my procrastination loop into my reasons for doing a blog in the first place. It’s not an assignment for me to do, a thing to check off the box, it’s much bigger than that. I connected deeply with why I do the work that I do in the world. I want to share what I know and be an example of what’s possible. I want everyone to know how to manage their minds and live their most abundant irresistible juicy life. That’s more powerful than any negative thought to get me taking action, and the same goes for you. Watch it if you are using negative emotions to propel you forward, it often leads to emotional fatigue. Stop resisting the feelings, be curious, go into them, allow them. The more you resist the more procrastination persists. I’m on stage still when I feel the tension of the feelings subside. When you pay attention, emotions are felt as vibrations in the body, and I start to feel them dissipate. I lift my head, my shoulders straighten, I feel lighter. I feel more confident. I know I’ll write my blog today. And I do so during lunch, easily without the resistance. It gets published like it does every Friday, I let go of the shame, I enjoy the evening with my colleagues, I’m grateful that I’m a NET practitioner and a thought zapping coach, and I’m one step closer to being 100% committed to myself. Ask yourself: "So WHAT if you have to take a few steps back to take 10 steps forward?” Let go of thinking this process needs to be perfect. It isn’t and it won’t be. Get coaching and NET. Let yourself out of prison. On stage, I come back to the consciousness of the room. In the last step of the NET process, Natalie instructs me to say what it was I wanted to be true again as she muscle tests me. I say, “I'm ok writing my blog today.” My muscle test is strong indicating that my brain is congruent with this statement. Hurray! You can do these steps in NET with just about anything you want to be “ok” with, a new career, a financial goal, public speaking, even a divorce. I feel clearer now. I know what I want and I go get it. I even start the blog for next Friday. I love providing you all with value and results ahead of time. That’s why I write to you. But almost every Monday at 10 am I don’t want to do it. But once I sit down and start that feeling goes away. It’s natural for your brain to not want to do this kind of thing, so don’t let that stop you. Know that you will feel that, and do it anyway. Keep your commitments to yourself even when you don’t feel like it. Cut to, today's Monday and I’m finishing up writing this blog for you and me. :) I feel good. I‘m enjoying it. Being in the flow. Our commitments to ourselves even when we don’t want to do it are the most important. My mind wants to run away and chatter to me about all the other things I have to do that I'm not doing because I just got back to Nice after being gone for 3 days. But I say, "no thanks mind, I’m not going there with you.” So I enjoy the process. Practice a thought that helps you feel the feeling you want to feel as you get something done you’ve been procrastinating on. For me, it’s commitment and flow. I focus my mind on deliberate thoughts, “That I have plenty of time,” and “I will get everything done,” and “I know this will help someone,” instead of my mind running wild like a toddler at home alone with a pair of scissors. When you resonate with this. I want you to think deeply about your life. Ask yourself: What is it you want that you want to be true about your life that isn’t right now? Think about what you really want. Know that you CAN absolutely get what you want in life. Know that you're worthy. Invest in yourself, in your dreams, in your now and in your future. If you struggle with perfectionism and procrastination, don’t let it continue to rob you of your dreams. It’s a half hour, get on a mini session with me and change your life today. I won’t bite and I won’t shame you, because I know all too well how this cycle hurts. Newer PostIf You Didn’t Say “I Don’t Know” How Would Your Life Be Better?